Well, episode two for me was a big shocker tonight. I was looking at the Golf Channel website today, checking up on their latest poll and William was a very close second to Derek in the voting on who would win BB PEI. I won’t tell you how I voted, but William’s elimination came as a complete surprise for me. I am not sure if it’s his good ole country boy demeanor that makes him so loveable, or maybe I see more of Boo Weekley in him than just his accent, but I thought William would be in for the long haul. I guess we all have “one of those days”, but Football didn’t seem to be comfortable in his own skin tonight. I am sure he can play better than that. His comment about par 3’s being his nemesis was very telling. I wish I knew what was going through his mind when he heard that he would have to play 3 par threes against Brenda. How much did his mindset play in his elminition? All speculation, but something tells me that it must have been a lot. Although we had some technical difficulties this week, William was a great sport about contacting me for his interview today. So many months later, I wanted to know if he was feeling like the windshield or the bug. And, of course, I was dying to ask where the nickname “Football” came from. I sure hope William can land some sponsors. He deserves a chance to show his stuff. Hey Golf Channel, what about a reunion? Next up is my interview with Brenda “What were you thinking with that 3” McLarnon. I love people like Brenda – no airs – no pretention – funny, self-deprecating humor – she’s just a hoot! You just have to love that woman’s attitude! I wonder if any of the ladies on Big Break Ka’anapali would have shared their ‘lucky charm’ with their competitor in elimination challenge. Not likely! LOL! Michael Michealides from Big Break X joined me again tonight to give his commentary on the show. Always great to hear from him because he’s “been there, done that” and knows how to critique a golf swing. Brian joined me today to share what he thought about episode 2 and his sound bites. He also sent a message to William that I really enjoyed. For Blair, I wanted to ask her about 2-3-2 putt. It seemed like a strange decision given she just had to beat Kim who had made a 4. I bet it was a crazy time out there for them all. Not at all like a regular golf game, I’m sure. I had trouble keeping track of all the scores, and I had a notepad! Well, I’m not making any predictions about next week. I have been completely wrong two weeks in a row and not about to make it a triple. But it will be fun to watch, of that I have no doubt. I’ll be sorry to see PEI go, the scenery is unbelievable. Hey Frankie. 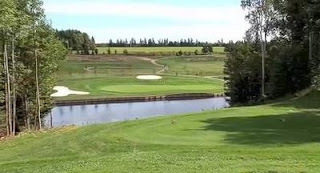 Just do what I did – I just booked a trip to PEI to stay and play at Rodd Mill River Resort in June. I can’t wait to see and play it in person. I’ll be sure to write all about it (with lots of pics) when I get back! Brian’s comments are interesting, particularly the aspect about Gayle’s site giving him a voice, and the impressions of people who he might interact with down the road. That’s why I’m so miffed Golf Channel.com has eliminated the lengthy solo confessionals in favor of a worthless group paste job. If they were maintained, we would have Brian in real time after each episode, for several minutes apiece. That could easily be compared and contrasted to the edited version of Brian, and also how he sounds months later in Gayle’s interviews, knowing the outcome. Golf Channel is including more contestant blog entries this time, but they are a pathetic substitute for the confessionals. I can understand Brian’s frustration regarding selected editing. The putting master comment makes more sense after he described how it unfolded. But it’s difficult not to laugh, and believe he’s been fairly portrayed, when he includes the line about being approached in the middle of the fairway for his phone number. Seriously, have you ever heard anything like that? You wonder how it isn’t immediately self-edited even if it did enter his head. Next week should be quite an interview. I’m predicting Brian will go over the 14+ minutes he filled here. He’s obviously a focus of the third show. I bet if GC knew that people wanted the full itnerviews, they might bring them back. I recently asked them why there wasn’t any WITB anymore for the players and they said that they might bring them back if viewers like that. I wonder if he’s in elimination next week – and if so, with whom? Some have guess Kim. Who do you think it will be? I’m not convinced Brian will be in the elimination. Charlotte Campbell put it well in her blog, that during the anticipation of the Highway 18 episodes, but knowing the weekly results, she noticed that whatever direction the tease took you, was the opposite of what had happened. If Brian is in the elimination, I think he’ll survive. I like Nicole but I have a feeling she will be eliminated soon, if not next. In her interview this week she volunteered info about short time to prepare, only two weekends of hitting range balls. I doubt that would have been necessary if she had many more episodes to go. Regarding the confessionals, I made a cutting sarcastic remark on GolfChannel.com, below the first group confessional. Frankly, I was surprised they printed it and it was not deleted because I called them wimps, or something like that. LOL. Charlotte’s a smart cookie, so I bet she is right. I think Kim goes home this week – just because they showed her next to Brian with her head down but she didn’t say anything. I think Gerina and Brenda must be safe along with Brian. But I don’t have a crystal ball, so we’ll just have to watch and see.